One tricky part of tweeting is knowing when to tweet. Flooding your timeline with multiple tweets at one time may not create a good impression on your followers, and they might think of you as a spammer. Scheduling tweets is nothing new to Twitter, with third party web applications available for this purpose. 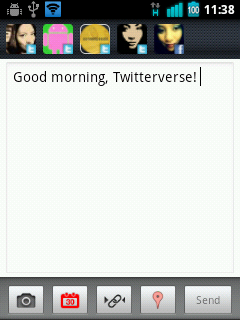 In Android, however, only a few Twitter clients offer this feature. One of them is HootSuite, a multi-functional Twitter client for both basic and advanced Twitter users. I started using this when the web version came out, and eventually they made the service available to Android. Install HootSuite on your phone. Create an account and setup all your Twitter accounts. HootSuite allows up to 5 social network accounts for free. On the app’s header, tap on the New Message icon. Write your tweet, then tap on the Schedule icon below (looks like a calendar). 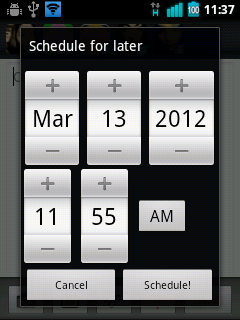 Set the date when you want the tweet to send and tap Schedule. Make sure you tap on which Twitter account/s you want to use for that tweet. To check if the tweet is scheduled, you can go back to the Streams screen and tap on Pending. You should see the scheduled tweet on the list. Only when it is sent will it disappear from that view. *Note: You can delete a scheduled tweet by going to the Pending screen and long-pressing the tweet. You’re done! It’s that simple not to annoy your followers, while getting the most out of your tweets by targeting a specific time when it’s most likely to be read. This is a strategy used by some bloggers for increasing traffic to their website, but it can be applied by people who don’t necessarily blog but is concerned about Twitter etiquette.